West Lancs Flooring have built up a solid reputation within the sports and leisure industry for supplying and installing sports flooring. Using all the top brands to ensure the safest most durable flooring for your specified needs. 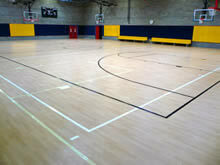 Designs are incorporated to ensure your sports flooring not only perfoms well but looks good too! West Lancs Flooring can advise you on the whole process from start to finish. We take care of everything for you. So if you are planning a new sports hall project, upgrading a surface that has become damaged or just needs replacing, then please contact West Lancs Flooring and let us explain how we can help you.